I always have had a love for German Shepherds and had the pleasure of sharing my life with my sweet boy named Briggs. I lost him suddenly and unexpectedly to stomach cancer on February 24, 2013. I never got to say good bye, but really how do you? I never got to thank him, but I know he knew how much he was loved. For all I have now are his memories, and there are many great ones he has brought to our family. Thanks so much for taking the time to share a little bit of your story of your sweet Briggs with us all here. I am so sorry for your loss. The loss of a pet, family member and loved one is never an easy one. If it helps at all, things do get better with time and your tears of pain will eventually turn into tears of joy and happiness with each memory that comes to mind. Your handsome Briggs will be a part of you forever more! RIP Mr. Briggs - I know EXACTLY how you feel. 3 months ago my GSD Ray has also succumbed to cancer - spleen caner, that got to his lungs. Unfortunately when we finally discovered that he is ill, was only when the cancer reached his lungs and he was coughing. a month before his death he seemed ABSOLUTELY FINE AND HEALTHY, and showed no signs of illness or what so ever. It was heartbreaking when the vet told us after an X-ray from head to tail that it wasn't kennel cough, but cancer, since we noticed his weight dropped. Once we were told what is his ACTUAL condition, it was agonizing seen him literally melting away. Every day for his last few days he was doing less and less activity, until he didn't even have the strength to go for a walk. He did at home on Saturday night and was suffering no more. Anyway - I know exactly how you feel and it is indeed unfair. I remember when we lost our first GSD, Rex, to kidney failure, we got Ray in less than a week. These 2 were absolutely differnet in character and size. Though it is tough to get another dog since you loved Mr. Briggs so much, I would suggest you to get one sometime (soon). Makes it easier and all. I am sure all dogs do go to heaven and Mr. Briggs must be there too. I told Ray on his last day while I was with him that once he gets to the "next level", to find my Grandmas and Rex and play tag with them. I really do they all play together and so is Mr. Briggs. I'm sorry to hear abput briggs, I fully understand the saddness it has brought you. At the moment I work for the government in Afghanistan. I don't know how to say this, I have a one years full german military pup with papers at the moment I'm not able to care for him like I should, He a happy dog and very smart. I just feel sad when I know he should be around people who love animals. If you interested and like to see him please send me an e-mail, he loves golfballs, baseball, and love to play catch me if you can. I would pay for all your expensive if you interest in him. Again Briggs is in my prayers here in AFGH. At the moment my daughter (Eris) is watching over him in Maryland. Dear Erin. i am so sorry for your loss of beautiful MR. BRIGGS. i grew up with GSD'S, lost my Jake in 2006 and now share my life with Max.still miss all of my dogs every day but with the years passing my memories of my dogs have become very dear to me and make me smile. sometimes when i see a dog that looks like my Jake, Buddy, Fritz or Sunday i smile and see my babies thru the other dogs. i hope in time your grief will be less and your wonderful memories of your beautiful boy will make you again smile. 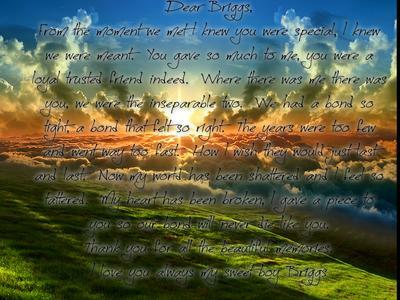 Mr. Briggs will meet you again in heaven. maybe someday you will share your life with another wonderful GSD or another breed of dog. God bless you and your family and watch over all of you. Erin, it puts tears in my eyes every time I see Briggs. What a beautiful boy. Best to you. Lt.Ron McCarty Sr Ret. march 23 2013 at the age of 9 years. God bless Briggs. May his memory live on in your Heart. So sorry for you lost. Briggs was so Handsome boy! I know you pain too well and that empty home feeling and your ache in your heart. Briggs is not suffering anymore. Maybe someday you can get another GSD or any breed it really doesn't matter cause dogs love unconditinally and there is no other love like that. Take care and know your boy is your guardian Angel now. Erin, your Briggs was beautiful. My Jake (now 5)and my Stanley (killed in 2009) are both splitting images of your Mr. Briggs. I have gone through this 6 times too many and it doesn't get any easier. Guaranteed you will cry for Mr. Briggs the next two years and beyond but that is Okay. Crying only reinforces the Love you and he had for each other. Looking at your Mr. Briggs it causes me to cry. Such beauty, it's unfair. It is said that God has a plan for us all and to have been with Mr. Briggs was a GIFT FROM GOD! Fear not, you and Mr. Briggs will again cross paths and be together again. Until then he will reside in your heart. Memories are important, just remember Mr. Briggs being in your heart is not a memory----it's real. Mr. Briggs, if you were as good as beautiful as you are there leaves little doubt Erin was blessed for only God could create the likes of you. Erin & Mr. Briggs, God bless you.